From the golden age of blockbuster televison aimed squarely at middle-brow Americans, Shogun is simultaneously magnificent, appalling and endearing. The year Shogun first aired on American television, 1980, was the golden age of the mini-series. Shogun fits comfortably into the mold established by Rich Man, Poor Man (1976) and Roots (1977): it was based on a popular novel, told a story with grand historical sweep yet which could be packaged to fit into a fixed number of television broadcasts, and featured a large cast (including some big stars) and high production values. The mini-series format proved extremely popular, and while not all of these blockbuster entertainments hold up today (Princess Daisy, anyone?) Shogun certainly does, despite its embrace of a few conventions which may make 21st-century viewers cringe. 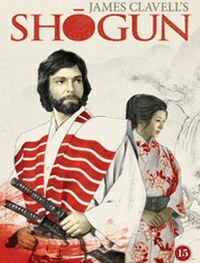 Shogun is based on James Clavell’s best-selling novel of the same name which draws on on the story of William Adams, an English pilot working on a Dutch merchant ship which reached Japan in 1600. The principal character is John Blackthorne, modeled loosely on Adams and played by the king of the mini-series himself, Richard Chamberlain. Blackthorn is the first English person to arrive in Japan and must find a way to survive in a culture which considers him to be a barbarian (not a surprising judgment, given contemporary European habits such as eating with one’s hands and rarely bathing). He must also deal with the already-established Portuguese traders and missionaries who regard him with suspicion not only because of his Protestant religion, but also because his presence threatens their cozy and profitable relationship with the Japanese. Everything about Shogun is big and impressive, from its running time (nine hours) to the large cast, superb location shooting, and obvious care taken with the sets and costumes (the castle sets were constructed using traditional peg and groove methods; every kimono was unique). The story is set in a crucial period in Japanese history as nearly 150 years of civil unrest were about to come to an end with the establishment of the Tokugawa shogunate in 1603. The narrative in Shogun is straightforward and easy to follow despite the rather impressive decision to leave the Japanese dialogue unsubtitled. Someone must have had a crisis of courage along the way, however, because the dramatic action is supplemented by narration (sonorously voiced by Orson Welles). The narration is fine when it conveys historical information (“That year, at dawn on the 21st day of the 10th month, the month without gods, the main armies clashed.”) but becomes annoying and intrusive when it tells us what characters are thinking and feeling (“In her heart, Mariko felt unworthy of such a beautiful ceremony.”). Despite being filmed entirely in Japan and featuring an impressive cast of Japanese actors (among them Toshiro Mifune, Yoko Shimada, and Furanki Sakai) Shogun is concerned primarily with Blackthorne’s story while the distinguished Japanese cast is reduced to being supporting players in the heroic tale of a white guy making good in a foreign land. On the one hand this seems appalling (in what sane universe would Richard Chamberlain receive top billing over Toshiro Mifune? ), but on the other hand it’s completely understandable given the context. Shogun was made for broadcast television and needed to attract large numbers of viewers, not just the few who might have seen The Seven Samurai or Yojimbo at an art house cinema. Shogun was a resounding success both in terms of popularity (contemporary estimates are that 70 million people watched the initial episode) and critical acclaim (it won three Emmys and three Golden Globes). Finally, it’s simplistic to label the “white guy bests the foreigners at their own game” trope an artifact of the Reagan years when in fact it’s a perennial of American popular culture as demonstrated by the commercial and critical success of films like (Dances with Wolves (1990), The Last Samurai (2003) and Avatar (2009). Another aspect of Shogun also nags at me and while it’s not enough to spoil the viewing experience, it is worth mentioning. While the Japanese characters behave as if they were living in the period of the story, Blackthorne appears to have popped out of a time machine, because his values are more typical of the late-20th century than the early-17th. For instance he recoils from what he considers Japanese barbarity (boiling captives alive, ritual suicide, beheadings), yet in his home country of England people were regularly executed for small thefts (the rich were beheaded, the poor hung), torture was used to extract confessions, and drawing and quartering was an accepted punishment for treason. One wonders if Blackthorne was equally shocked by such cruel practices at home or only developed a soft heart after his extended sea voyage. I’m kidding, of course: the character was imbued with values consonant with those of late-20th-century Americans because heroes are more appealing if they hold values similar to one’s own, however illogical such an arrangement may be from a historical point of view. The DVD release of Shogun comes with a generous package of extras. Three historical featurettes (about 15-minutes total) combine clips from the show with interviews with academics who provide background on the samurai, the tea ceremony and geishas. A making-of feature (about 80-minutes) provides useful behind-the-scenes information through interviews with the director, screenwriter, actors, and others involved in the production. Commentary by director Jerry London on 7 scenes (about 12-minutes total) is less useful: too often he simply describes what is happening on screen and how the scene fits into the overall story and provides information also available in the making-of feature. There is one odd technical burble in these extras: the final spoken line appears as yellow text on a black screen after the conclusion of each segment, even if the subtitles are turned off.